Lee Bryce is chased down by former Scotland and Dundee United defender Garry Kenneth. Kennoway made the short journey over the Tay Bridge to take on league favourites Lochee Utd. Gradually it was KSH who looked the more likely to open the scoring. Deploying a 3-5-2 system the Fife side began to pose a threat to the experienced Taysiders. Craig linked up with Grierson on the right only to see his shot charged down by the imposing Garry Kenneth. The opening goal arrived on the 15th minute and it was KSH who scored it through striker Bryce. A fast counter involving Collins,Young and Band saw the ball arrive some twenty yards out at the feet of Bryce. The striker caught out Ewing when his snapshot crept inside of the post. 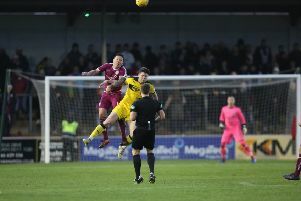 The hosts levelled when a ball played down the Kennoway left took out two players leaving Lawson an opportunity to slide the ball past Swinton. The away side almost regained their lead when in form Liam Craig hit a shot from distance that brought out the best of the Lochee `keeper Ewing. Buoyed by the goal, Lochee upped the pressure and they were denied a second goal when Swinton equalled Ewing`s save minutes earlier with an instinctive block from a point blank header. The second half was minutes old when Young cut inside from the left to fire in another shot that had Ewing sprawling low to his left as the ball went out for a corner. From the resultant corner kick Brewster saw a header cleared as KSH almost had the perfect start to the second period. A corner kick from the left with fifteen minutes remaining finally saw Lochee take the lead for the first time. Swinton this time had no chance as centre back Millar powered home a header from a few yards out. The players looked dejected after working so hard in protecting their goal. With a few minutes remaining Grierson saw a second yellow then subsequent red reducing KSH to ten men. KSH: Swinton, Young, Bremner, Rolland, Brewster, Grierson, Craig, Collins, Johnstone, Band, Bryce. Next game is at home on Saturday against Thornton Hibs with kick off 2.30pm.